Although we may take them for granted today, matches are a rather clever invention that enable us to light fires anywhere we choose, armed with nothing more than a simple stick covered in a special coating, along with something to strike it against. Add in the notion of a waterproof match, and this simple invention is transformed into so much more, with many potentially lifesaving features to offer the outdoor and survival enthusiast. The waterproof match is an essential and invaluable tool, and one which could potentially save your life. Although essential for the outdoor enthusiast, the best waterproof matches could also serve an important role in your home first-aid kit, wallet, or even in the kitchen. As with most all pieces of gear, all brands and types of matches are not created equal, and there exists a wide variety from which to choose. Those in the market to purchase waterproof matches should not take the decision lightly, especially when considering that, when put to the test, your life could be on the line. Choosing waterproof matches, and learning about the important features they offer, could be one of the most important life-saving decisions you make as you prepare for the unknown. Naturally, waterproof matches bear a higher price tag than everyday matches, but the price is still relatively inexpensive when it comes to survival gear, so you should never consider going on an outdoor adventure or camping trip without them. Normal matches are quite prone to being ruined by water or even just humidity, and waterproof matches are designed to stand up to the elements much better and for much longer. Taking the time to learn about the best waterproof matches ensures that you will choose the best product for your needs, and it could even save your life. As we mentioned earlier, not all waterproof matches are created equal. When shopping for them, it is important to understand which features matter most to you so that you can more easily compare brands and find the best matches to meet your needs. Like with most gear, it is worth your time and effort to field-test waterproof matches before you are in a position to rely on them for survival. Some of the best features you will want to test in waterproof matches include: storm proof, wind proof, and extra-long match length. Other optional features include strikers and storage canisters. Continue reading on to learn more about these features and what they mean to you. The top waterproof matches are those designed to be storm proof. These matches are designed for harsh and extreme weather conditions, such as heavy rains, ice, and falling snow. Waterproof matches made for these elements are actually able to light a fire and stay lit, even under the most unimaginable of weather extremes. What this means to you is that no matter how harsh and cold of conditions you may find yourself in, you can put your mind at ease knowing that you will be able to make a fire, even if you are unable to find shelter from the storm. Waterproof matches which are also windproof are able to be lit and stay burning under the windiest of conditions. In fact, when testing if a match is windproof, the flame may be so strong that you are unable to even blow it out with normal effort. This gives you piece of mind to know that you won’t be without fire, no matter what nature throws your way. For this reason, it is recommended to test windproof matches outdoors, as this type of match is known to produce a lot of smoke as well. Extra-long match length helps protect your fingers from the match’s flame, and also allows you more time to light things with it before it burns out. This may be a more difficult feature to appreciate until you are in the position to need it, but when you are facing all odds to get a fire lit, and you finally succeed, every second counts. Especially if your fingers are numb from the harsh cold, it’s even more important to protect them by maintaining a safe distance from the flame. How easy a match is to strike is an important feature of waterproof matches, but it is important to keep in mind that just because a match is easy to strike does not necessarily make it a better match. By nature, waterproof matches are more difficult to strike than other matches due to the special coating that protects their tip. It is important to learn how much effort it takes to strike a waterproof match, and what kind of striker is required before you are in a position to rely on it. Although most matches come with a striker or two, these may wear out quickly, and may not themselves be waterproof, which would, in turn, render the waterproof match useless you find yourself in a position where you have the match, but lack a means to strike it. Storage canisters are often purchased with waterproof matches, as well as on their own. The best canisters will be durable, waterproof, easy to open, and seal tightly. What these features translate to for you is that if you should find yourself deep in the wilderness under wet and treacherous conditions, you will want to have a storage canister that is waterproof as well in order to keep your waterproof matches from getting wet, is easy for you to open with wet and trembling, cold fingers, so that your matches will be there for you when you need them, otherwise you could be stuck out in the cold. Another tip many swear by for storage is a waterproof 35 millimeter film storage canister. You can even outfit the underside of the lid with heavy sandpaper for striking. Here are a few product recommendations that you should check out if you are in the market for a good kit of waterproof matches. The UCO Stormproof Match Kit will ease your mind in a variety of weather scenarios. Uniquely able to withstand heavy rains, wind, and even falling snow, these storm, water, and windproof matches will not let you down, and you will be able to light them up fast and burn them for up to 15 seconds each. You can even relight them again after submersion in water. 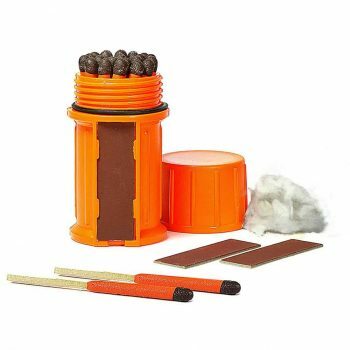 Each kit contains 25 matches, 3 strikers, and waterproof, buoyant case outfitted with a cotton ball. Although the case is made of a durable, ABS plastic, and is designed to be waterproof and withstand many elements, some users have reported it to take in water under the most extreme of wet weather conditions, so it may be a good idea to reinforce it according to how you plan to use them. The case can accommodate a total of 40 matches (they should be stacked alternating face up and face down), but the packet includes just 25 sticks of the length 2.75 inches. If matches get wet, simply dry them before lighting. The striker surface is not waterproof and you will need to protect it from bad weather yourself. A plastic bag will serve the purpose, keeping the striker dry during your adventurous trip. We won’t recommend you to keep the matchsticks and sticking pad in the same container. Till the time, the coating has not gone, the stick will reignite and burn, which makes it worthy of the price it. If a striker gets wet, use one of the two included spares until it dries. Strikers are very thin though, and are known to wear down quickly, so it may be helpful to pack a reliable striker, as these can be difficult to light without a proper striker. 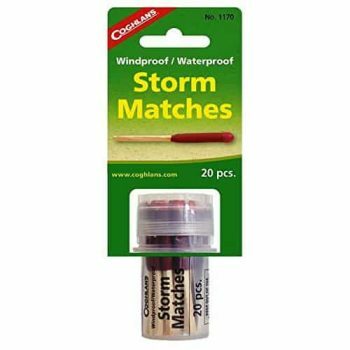 This kit will last for years if kept dry, and when it comes to truly storm proof matches, these are the ones hard to beat. Related: The Esbit 1300-Degree Smokeless Solid Fuel Tablets is a great smokeless and residue-free solid fuel tablets that can be used to cook food, boil water and start camp fires. It’s a top rated product that goes great with the match kit that’s featured above. These Coghlan’s 1170 Storm Matches are intended to be windproof and waterproof, and to burn even in the heaviest of storms and even to stay lit when wet. They are also designed to light up in a variety of weather conditions as well. These come packaged in a small tub, with striking surfaces on the top and bottom. Although the tub bears two strikers, these ones are more like a sticker variety, and may wear off easily, so a helpful tip is to use a more reliable striker with these matches. Although the tub is compact, and the small size makes it easy to carry with you, the matches themselves are small too, which can make this brand a little less safe than others because fingertips will be closer to the flame, and you will have less time to work with the flame before it goes out or comes dangerously close. The match head burns for 10 seconds and that’s quite enough for you when you are trying to light up stoves and campfire while you camping on the backcountry treks. Affordable and effective, this one is going to work the best for you. Related: When buying this product people also buy Coghlans 940 BP Waterproof Matches. The waterproof striker and heads is something that you will always need when hunting, fishing, camping, and going for any sort of outdoor activity. There are 40 matches in each box that will reignite even when it is wet. Anyone who is going for a long camping trip, this one is the perfect pick. 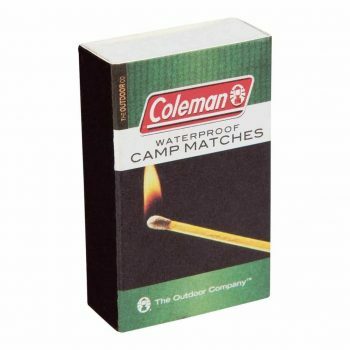 From Coleman, known for their outdoor products, the Coleman 829-205T Waterproof Matches come packaged in a small, cardboard matchbox with an exterior striking strip. 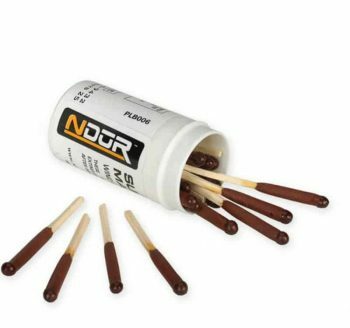 Although the matches themselves are designed to be waterproof, the package and striker are not, so these should be stored accordingly so as to avoid any moisture or humidity, as they are very susceptible to even small amounts of moisture. 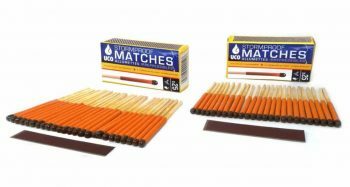 While stronger and more resistant to water than standard kitchen matches, these matches may perform great for light outdoor use, or even around the home or for kitchen use, but when put to the test under the elements, these matches simply fail to match up to other storm and windproof brands. The matchsticks themselves are small and flimsy, and have been known to snap or break in half under pressure. The waterproof coating on the match head can make it difficult to light. It is more likely to burn up easily, so you will have to handle it a bit quickly, else you might fail to ignite the camp. Also, don’t expect them to burn after you leave them a bowl of water for 15 minutes, it will ruin the wooden stick and chip off the red material on it. Keep them safe and they can work in the worst weather also. Related: People who bought this matchstick for camping purpose also buy the Coleman CPX 6 Rugged LED Lantern. The lantern is compatible with CPX6 and works with 4 D cell batteries that can work up to 23 hrs when on high setting and 113 hrs when on low setting. The UCO Stormproof Matches are suitable for a variety of weather scenarios, especially in wind and rain. For matters of survival and extreme weather, these matches should be your first choice. Even in heavy rains, these popular matches have the capability of staying lit for up to 15 seconds, and they will actually light up and stay lit underwater. Do be aware, however, that as it tends to be the case with storm proof matches, they can sometimes be difficult to get lit in the first place. They also do not light up as quickly as some other matches, and extreme caution should be taken to avoid accidental burned fingers. If matches get wet, simply dry before lighting. These matches do generate as a great deal of smoke, which is another factor in why they are best suited for outdoor use. The matchbox itself and the striker on its side are not waterproof. Although two additional strikers are included in the box, a useful tip may be to pack a reliable waterproof striker alongside these as well. Related: For a reliable match case that gets the job done, the Exotac MATCHCAP XL Waterproof Match Case is a good option. 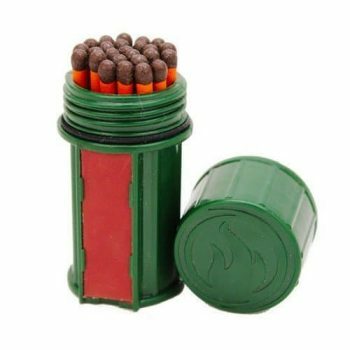 The integrated red phosphorus striker inside cap will keep your matches dry and protected. The Proforce Survival Matches are waterproof and windproof, and they are designed to be used even when wet. They are also the only NATO (North Atlantic Treaty Organization) approved matches on our list. Designed to be lit in a wide array of extreme weather conditions, Survival Matches can withstand immersion in water and cannot be extinguished by the wind. The match head is designed to burn for 12 seconds, however, many users have reported that it burns for a lot less than that, and that as soon as the head burns out, the flame goes out, which may not leave much time for the purpose for which you intend to use them. Approximately 25 matches come in each sealed flip top canister (two canisters per pack). Keep in mind, some users of this brand have had trouble getting the lid to stay secured once opened, so you may want to use reinforcement if you choose this brand. What we most like about this matchstick is it will come back to life, even if you give it a full mouth of air. We will recommend you to carry with you an extra piece of sand paper because the sandpaper is not waterproof and once wet can perhaps there could be a problem. If you are carrying extra strikers in your bag, these matchsticks are one perfect buy. Related: The NDUR Lenstatic Compass is a product that you can buy with these matchsticks, especially when you are going out in the wild. The compass helps you to read the map properly and will help you track your path correctly. The metal case is liquid filled with luminous sighting dots around. These BigTProducts Storm Proof Match Kit are another solid option when wind, water, and storm proof matches are needed. They may be somewhat easier to light than other competing brands, and they will also last up to 15 seconds. Even if submerged in water, these matches will still light. They come stored in a rugged green, composite cylinder sealed with an O-ring that helps keep the elements out, with a striker on its side that is found to be a bit more durable and lasting than the strikers found on some other brands. Spare strikers are also included inside the case. We like the container it comes in and the most amazing part is, the container keeps floating and keeps the content inside safe and dry. With this container, you don’t even have to worry about the humidity that usually chips the material off the stick. For all the perks it comes with, the price is not high and you are likely to not worry about lighting up while camping. Related: Want something that will get your fire going in the fastest way possible? The Exotac tinderTIN Fire Starting Shavings might just be what you need for a quick and hot burning fire. It also helps that it is wind and moisture resistant. No matter how well you understand the features of what a match and its accessories are designed to do, there is no better way to prepare yourself than to actually try them out and see them in action. This may also help you realize some additional accessories, precautions, or preparation you may need to do before you incorporate them into your regular gear. Hopefully this article has helped you feel more confident in choosing, testing, and using waterproof matches. We have explained six different options we believe to be some of the best, and we have given you some helpful tips and ideas about what to expect. We would love to hear what your experience has been with waterproof matches. Have you ever found yourself in a situation where waterproof matches saved the day in an emergency? What are some of your favorite brands? Let us know by leaving a comment below!